The former BHP House was constructed from 1969 to 1972 as the national headquarters of the Broken Hill Proprietary (BHP) Company. The architects of the forty-one storey steel, concrete and glass building, Yuncken Freeman Architects, worked closely with engineers Irwin Johnson and Partners to design a fine engineering structure, the tallest building in the city at the time. In developing the design for the tower, project architect Barry Patten and his team sought assistance from architects and engineers at the Chicago office of Skidmore Owings and Merrill, spending ten weeks there in 1968. The former BHP House is of architectural, scientific (technological) and historical significance to the State of Victoria. buildings in the State, demonstrating the principal characteristics of early 1970s multi-storey office buildings. When constructed, BHP House was a landmark in both the physical and historical development of multi storeyed office design. It heralded a new aesthetic in high-rise buildings, with the replacement of 1950s and 1960s banded curtain walls and externally- expressed service cores with a new all-embracing sheer glazed curtain wall. BHP House was designed, like similar earlier buildings of Mies van der Rohe, to be viewed as a three dimensional sculptural monument separate from the surrounding cityscape. The open plan, fully glazed, ground floor plaza, which raises the bulk of the building to the first floor level, increases the sense of distinction. The building is an outstanding architectural expression of corporate image, especially through its innovative and extensive use of BHP's steel technology. The building was also distinguished by high quality and co-ordinated interior design, furniture and artwork, all now unfortunately removed. The former BHP House is of architectural significance as one of the most noteworthy buildings designed by the Melbourne firm Yuncken Freeman Architects , who designed many multi- storey office buildings in the Melbourne CBD from the 1950s through to the 1970s. Other significant Yuncken and Freeman buildings include Estates House (1976), next door to BHP House, the Sidney Myer Music Bowl, and La Trobe University. The former BHP House is of scientific (technological) significance for its innovative structural application of steel and concrete. New techniques were employed for the foundations, which were comprised of a concrete raft poured in a single continuous action. The composition of the floor structure, which was of steel decking and lightweight concrete over steel beams encased in asbestos rather than concrete to reduce weight, was also innovative. This flooring acted as a stiffening element in the overall structural design of the building, along with the cap and belt trusses, allowing the structural loads to be carried down through the outer skin of steel and the central services core. This produced open floorplans, devoid of internal columns and increasing the flexibility of internal space. Many of the fundamental ideas informing the layout and arrangement of BHP House were retained as standard features of high rise office buildings in subsequent decades. The building was also innovative in its adoption of a new energy efficient 'total energy system', generating its own electricity using BHP natural gas. Unfortunately, this has now been completely removed. The Former BHP Building is of historical significance as a symbol of major changes occurring within Melbourne in the last several decades of the 20th century. As an isolated sculptural monument, isolated from the traditional streetscape, it reflected the transformation of Melbourne?s CBD into a corporate and government core, as retailing, industrial and warehousing functions followed the city's population to the spreading suburbs. The building was part of a trend towards much larger projects on consolidated blocks that was to change the face of the city forever. 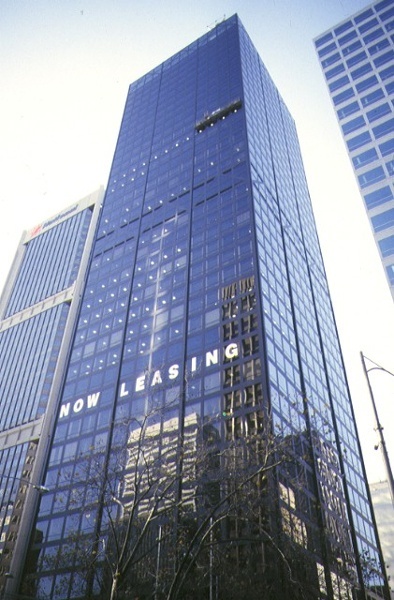 Like the ICI Building a decade previously, the construction of BHP House heralded changes to Melbourne town planning codes allowing further increases in height and floor area. The corporate image of money and power is clearly expressed in this shining monolith, which was also a reflection of the prosperity of resource companies at a time when there was great optimism about the potential for resource-led economic growth in Australia. Former BHP House, 140 William Street, Melbourne, Melbourne City Council. 1. 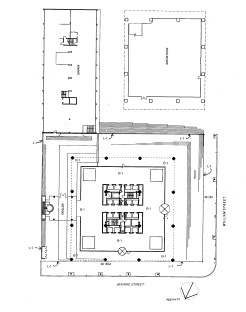 All of the building known as the former BHP Building and marked B-1 on diagram 605797 held by the Executive Director. 2. All of the land marked L1 on diagram 605797 held by the Executive Director, Heritage Council, being all of the land described in Certificate of Title Volume 9125 Folio 053. 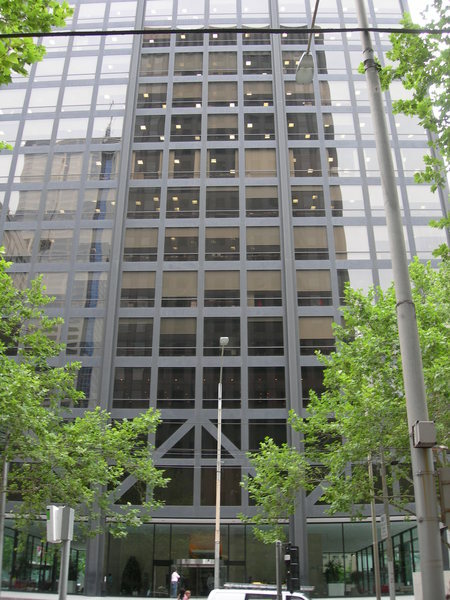 The former BHP Building, at the corner of Bourke and William Streets, Melbourne, was constructed in 1970-2 to the design of Melbourne architects, Yuncken Freeman and engineers Irwin Johnston & Partners. The building was to be the headquarters of BHP and in this role was to provide the Australian public with an advertisement of the possibilities and scope of steel production in the early 1970s. The building extended public perceptions of the role of steel in the construction industry. 1. The building must have a fundamental structural integrity expressed in the overall design and not influenced by transient fashions or stereo-typed design. 2. Steel must be used wherever possible, involving the development of new architectural uses. 3. The overall economics must be based on a satisfactory investment return, as at least 50% of the building is to be let in a highly competitive market. 4. Company requirements for office space call for floor area of approximately 10,000 square feet. 5. The quality of office space must be superior, both for Company departments and commercial space to be let. 6. The building complex must make the maximum civic contribution, providing as much public space as possible at ground level. It must be a significant landmark and at the same time blend with the city skyline. Many of the requirements the brief were not allowed in the regulations set out by the Melbourne City Council Planning Scheme at the time. Several such regulations were waived for the first time to allow the construction of a building greater in height than twice the width of the road which it faces and a relaxation of the total floor area limit. These relaxations were seen as a watershed in the planning provisions of the council and set a significant precedent. During the planning stage of the construction of BHP House, Yuncken Freeman and Associates consulted with North American architects, Skidmore Owings and Merrill who designed many other buildings of similar steel framed construction. The inspiration for many of these seminal buildings were the earlier Mies van der Rohe structures. BHP House is very similar, aesthetically, to Mies’ Federal Centre, Chicago (1956-65) which has a similar glass to framing ratio on the external facades and banding, a similar open plaza and recessed external walls at the ground floor level which allow the bulk of the building to ‘float’ above the ground plane, increasing its three dimensional qualities. This three dimensional quality is characteristic of much of Mies later work, when he became interested in the dichotomy existing between ‘structure’ and space’, an interest which revealed itself most obviously in his use and treatment of glass, 'used in such a way as to allow it to change under light from the appearance of a reflective surface to the disappearance of the surface into pure transparency: on the one hand the apparition of nothing, on the other, an evident need for support.’ In his later phase, from the late 1930s until his death in 1967, Mies was concerned with the creation of buildings ‘rendered as pure prisms, faced with graph-paper curtain walls, their surfaces animated by skyscape reflections’, also struggling with the integration and interweaving of fenestration and structure achieved in the bronze and brown glass Seagram Building (1958) in New York which employs a fenestration and structural pattern which is almost identical to that used by Yuncken Freeman at BHP House, and indeed in several of their other high rise structures, including the adjacent ANSETT house. BHP House is a good example of a building in the continuum of high rise construction in Australia from the post-war years. The early buildings of the mid to late-1950s suggested many of the ideas which buildings like the BHP Building in the late 1960s expressed fully. Freestanding high rise buildings of light weight curtain wall construction from the 1950s were designed to be a distinct, sculptural urban element, with open plazas encouraging a perception of their detachment from the urban fabric. Multi-storeyed office block construction in Melbourne was well established by the 1950s when the construction of the ICI Building in East Melbourne, designed by Bates Smart and McCutcheon in 1958, took this type of construction to new heights. The height limit was relaxed to allow this twenty storey building because of the amenity afforded by an open plaza in front of the building addressing the street. When constructed the ICI building was considered the most advanced architectural statement of its time in Australia, with curtain wall construction , expressed external service core, and concrete clad steel framing, all clearly manifesting the optimistic Australian culture which encouraged progress and manifestations of development, expansion and prosperity. Yuncken Freeman Architects were involved in the construction of many high rise office blocks, and were one of the few architectural firms providing competition to the nationally acclaimed architectural firm, Bates Smart and McCutcheon who dominated this field. In 1967 Yuncken Freeman were responsible for the eighteen storey Royal Insurance Centre at 440 Collins Street, clad with precast concrete panels glazed and fitted with dark tinted glazing and involving construction techniques not previously used in Australia. It was this building that introduced ‘an unprecedented aesthetic of Miesian minimalism to Australian architecture’. However it was with the construction of BHP House that the architects tested new engineering techniques which allowed the height and monumentality as a three dimensional building removed from the surrounding urban fabric which became so much a part of the Miesian philosophy after the war. BHP House was designed, primarily and foremost, as the flagship building of Broken Hill Proprietary. Distribution of the load-carrying elements in the overall structure to the best advantage, in order to minimise the percentage of steel required to resist wind loading. Arrangement of connections between the various elements in a manner which controls the nature of the loading applied to these members eg. simple joints between floor beams and columns ensure that each column carries a primarily axial load and the floor beams are not loaded by wind bending moments. Proportioning of each element so that its basic shape is of high structural efficiency while maintaining a reasonable overall fabricating cost. Maintaining a symmetry of layout wherever possible. Generally, the particular facets of the building which required concentrated effort to achieve these aims were for efficient wind resistance, column weight reduction and floor beam design, with the aim of reducing the percentage of steel in the structure of the columns and floor beams whilst retaining an appropriate wind load rating. The solution to this engineering problem was the integration of three elements; the braced core, outer tube and external facade trusses. The braced core sets the dimensional control of the building with four core columns braced with triangular trusses on every level. The external facade of the building acts as a tube of resistance which, acting with the inner core, provides resistance to wind deformation. The efficiency of the system created by the inner core and external facade is strengthened by belt trussing on the external facade and by cap trussing. .
As well as the principal system acting to provide resistance to wind deformation, stability and solidity to the building, many smaller details combine to produce a building of remarkable engineering ingenuity. Among these innovations were the castellated floor beams able to span greater distances, which effectively eliminated the need for internal columns meaning that office floor areas were uninterrupted. Other innovations in BHP House were the clustering of the services around the central core. Proposals for BHP House included the addition of an eight storeyed annexe for car-parking. The builders of BHP House, EA Watts, were a large Victorian construction company who were responsible for the construction of many early high rise buildings, including the first ICI House. For the design of BHP House, Yuncken Freeman were awarded the Bronze Medal of the Royal Institute of Victorian Architects in 1975. This was a somewhat controversial winner of the state’s most prestigious prize for architectural design for its being ‘clearly a superb piece of sculpture and a magnificent landmark for Melbourne’. Whilst the subjectiveness of the first comment cannot be mistaken, the BHP Building was certainly a landmark building, towering over the CBD in a similar manner to that of the John Hancock Building in Chicago. At forty-one storeys, the building was the tallest in the city and remained so until the construction of Nauru House in 1976. After construction, in December 1974, the roof of BHP House was fitted with equipment to conduct stress studies which determined movement in buildings. This was part of an international study and this was the only building in Australia fitted with the appropriate equipment which would track air movement and assist the future design of high rise buildings. Phillip Goad dated April 1998 and endorsed by the Executive Director. elsewhere in Basement 1 or 2 is permit exempt. system of recessed ceiling lighting.